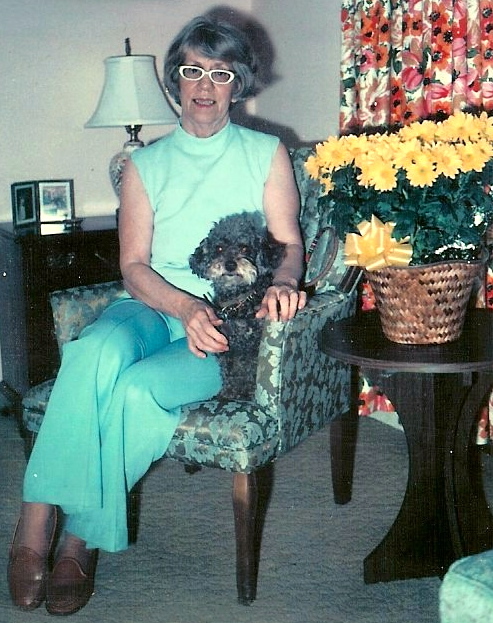 My mother had lost her poodle, Jossie, to a long illness and had grieved for many weeks when a friend suggested that she adopt another dog and recommended the Bosler Humane Society, an animal shelter not too far from their home in Westboro, Massachusetts. Organized just a few years before, the shelter cared for abandoned and abused animals. 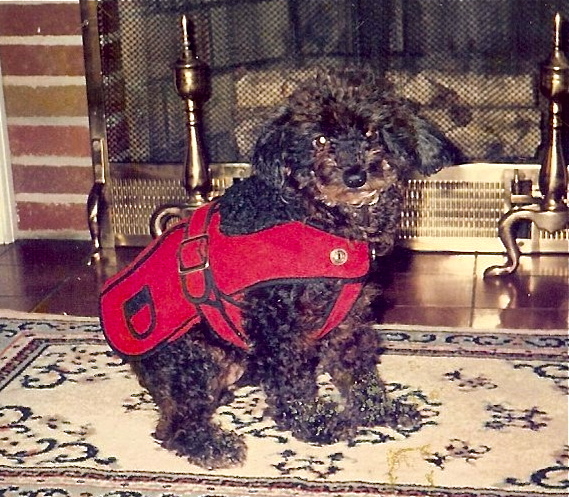 Elaine Bosler, founder, guided my parents to a dog who she thought would be perfect for them: Suzie, a chocolate miniature poodle. Her former owner could no longer keep her for reasons that seemed mysterious. 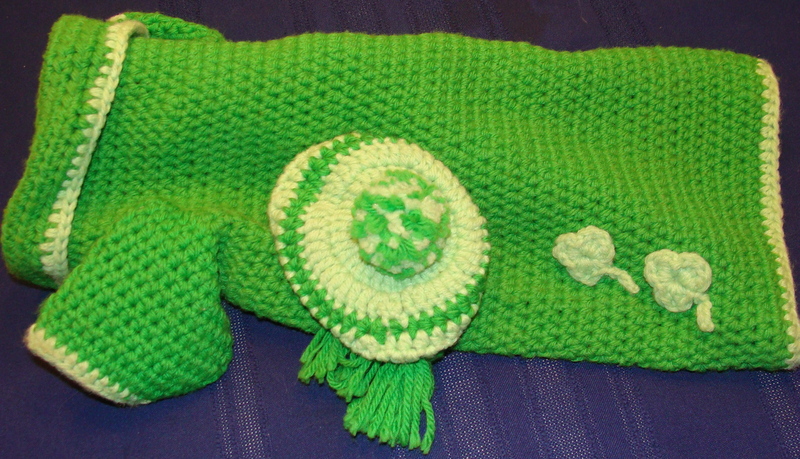 Her former owner treated Suzie well and had knitted her six matching coat and hat outfits and had even bought her sweaters, wraps and a plaid raincoat. Suzie came with an entire wardrobe! Suzie fit right in with her adopted family and became my mother’s constant companion. Mom would occasionally dress Suzie in her little outfits. Suzie was always present family events as Mom and Dad took her everywhere with them. All the grandchildren loved Suzie. My parents eventually moved back to Pennsylvania and settled in the same town where we lived. My father and I cared for Mom in the last stages of cancer. Suzie remained vigil at her bedside and was with Mom during her last moments. Dad eventually moved in with us and along came Suzie, too. After Dad passed, Suzie continued to live with us. A quiet dog, affectionate and well-behaved, she remained a little lady who would be dressed up when she headed out. Suzie’s gentle nature served her well, and she passed away when she was 22 years old. The vet said she thought she was the oldest dog she had known. On a crisp November afternoon, our family buried her ashes at my parent’s grave site. We didn’t ask for permission to hold our farewell ceremony. 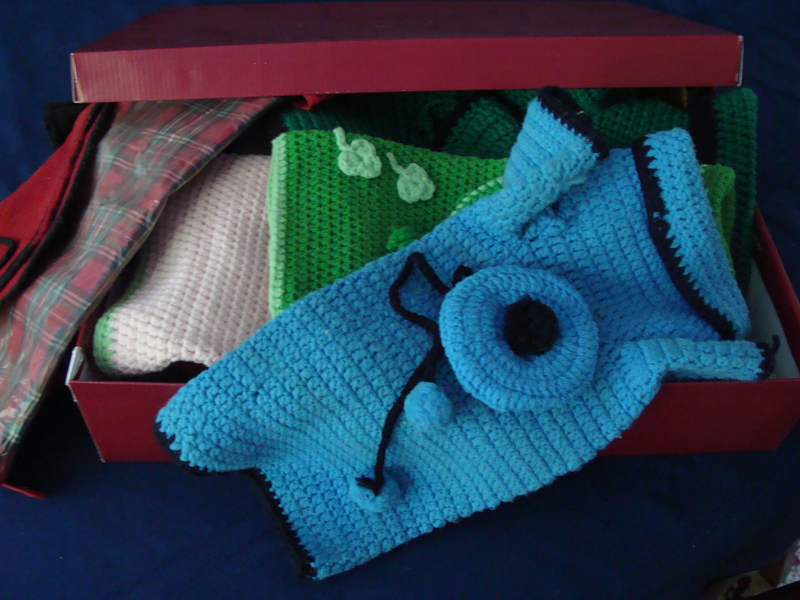 I placed the little coats in a box the attic. Ten years later, I came across the box tucked away in a back corner under the rafters. What was difficult to figure out years before, the obvious choice now seemed clear. Since our kitties did not choose to wear the outfits, I donated the coats to the Animal Coalition of Delaware County, an organization dedicated to finding places for homeless animals. I‘m sure Suzie would approve.